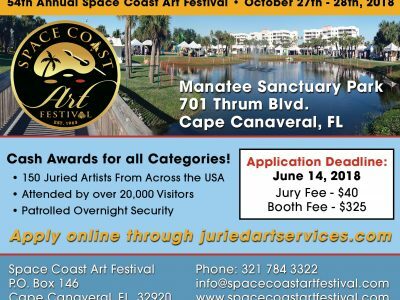 The 51st annual Space Coast Art Festival, held each year over Thanksgiving Weekend, will be November 29th and 30th, 2014. Saturday hours are 9 a.m. to 5 p.m. and Sunday from 10 a.m. to 5p.m. 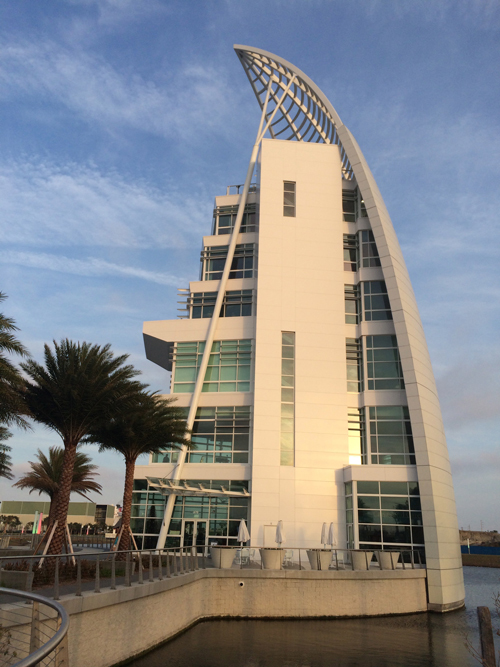 The Festival is moving to the Exploration Tower at Port Canaveral this year. This new location offers spacious accommodations that allowed us to create an artists’ booth layout that flows easily and will be more accessible to patrons. The venue also has abundant parking for artists and patrons, including trailers and RVs and is easily accessible from main interstate highways. There are numerous restaurants and hotels nearby, including a campground site – and is only 15 minutes North on A1A from our traditional location. SCAF feels that Port Canaveral is a great alternative location that will accommodate artists and patrons while still maintaining the same quality that we have been proud of for over 50 years. The Space Coast Art Festival is pleased to host over 240 artists for this year’s festival. This year’s festival will kick off with a “Taste of The Port” Judge’s Reception on Friday, November 28th from 7:00 P.M until 8:30 P.M in the Exploration Tower at Port Canaveral. 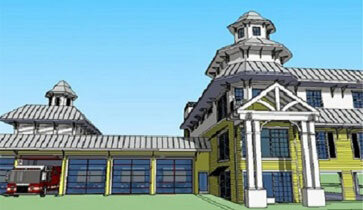 The reception will feature flavorful dishes from the popular restaurants that make Port Canaveral a dining hotspot. As always, the Judge’s reception will provide a meet and greet opportunity with this year’s Judges and the 2014 winner of the annual poster design contest. Tickets are required for this reception. Please contact the Space Coast Art Festival office to purchase tickets. (321) 784-3322. In addition to hosting many nationally recognized juried fine artists, we are proud to host a Student Art Show that will showcase our local up and coming artists on Saturday, November 29th. There will also be a Hands on Craft area where the young art enthusiasts can try out their talents in an inspiring setting. In addition to the festival’s move to Port Canaveral, the Space Coast Art Festival has added some new and exciting components. The Space Coast Art Festival has partnered with the Daily City Food Truck Bazaar to bring this culinary experience to Port Canaveral for the first time. Patrons will be able to purchase a unique variety of food that will be sure to compliment the fine art at the festival. As always, Space Coast Art Festival will provide free live entertainment from 10am-5pm both days for all to enjoy. This year the Festival is thrilled to announce that it will feature a performance by the band PANAMA on Saturday from 2:00 P.M until 5:00 P.M. This year’s musical lineup is sure to ROCK! In order to provide the public with a sneak peak of the Festival, we have posted the following map to our website. This map showcases the layout and location of our Festival. There will be plenty of free parking available as well as free shuttle service from lots within Port Canaveral and designated parking locations along A1A. The Board members at Space Coast Art Festival are proud and excited to be a part of this year’s Festival. We look forward to a joyous Thanksgiving weekend that has been our tradition for the past 50 years! The SCAF Board of Directors has determined that we are unable to accommodate the festival in Cocoa Beach this year due to extensive municipal construction in downtown Cocoa Beach despite numerous attempts to layout the show in various configurations. Click to Read More.